Prof. Brown, during his 27 years of studying water and its atomic structure, experimenting with disassociation of water into its constituent parts of hydrogen and oxygen has noted that there are many variations of the atomic structures of the various waters dependent on the mixing of the three hydrogen isotopes (1H – protium, 1H2 – deuterium, 1H3 – tritium) which combine into six combinations of hydrogen and the six oxygen isotopes (8O14, 8O15, 8O16, 8O17, 8O18, and 8O19 ) — or practically, 36 types of water — 18 are stable and 18 have short life. Now, because we have all of these types of water, we could have 36 types of Brown’s Gas, and much more with special modifications of the gas; at the moment only a few are under investigation. His studies have led to the observation that the anomalous behaviour of water depends on the ability of water to modify energetics and physicochemical properties of the various permutations of the hydrogen/oxygen isotopes. As is known the lifetime, modes of decay and thermal neutron capture cross-sections vary significantly between these isotopes; likewise, Brown has seen the various stages of his gas offer very different effects. He has found that he can modulate a number of suitable mixes for his technology, thus providing an engineering tool in decontamination of nuclear wastes. The first few paragraphs are repeated from the Ascension Assistance page; new information follows. The velocity of the flow of water in an imploding vortex multiplied by the radius from the center of the vortex is theoretically infinite. As these forces increase the hydrogen bonds of the water molecule cannot sustain the pressure difference and begin to dissociate, at this point they can be permanently restructured (the bond angles). So first one needs to create a very powerful, very, very, very swiftly moving imploding spiral flow of water. We find the circumference of the vessel relative to the speed, of import, and of course the Golden Mean enters into the equation here. The glass vessel containing the imploding water vortex lies in the midst of a large crystal grid, the angles of the relationship between the crystals as well as the type and resonance-quality of import for creating natural scalar, or standing waves. The equipment with the glass vessel containing the imploding water vortex is surrounded by a Tesla coil: actually two coils intertwined as one (Tesla technology does not produce harmful EMF or any form of electronic polution). At this point the liquid medium can be permanently restructured within a standing (or scalar) wave; permanently is the key here, most structured water will revert back to it’s disorganized state (the hydrogen bonds begin to break between the crystal like structures; liquid entropy.) The key is the point where the effecting change is implemented to permanently restructure the hydrogen bonds. Scalar waves positively utilized (they are also being used destuctively in weapon systems) have numerous health enhancing qualities beyond this, and hold a key to cellular regeneration, but for any of the positive qualities to be imparted they need to be “locked in” to the formulation. We use sound, both within and beyond our human auditory range, sonics and ultra sonic frequencies, as well as pulsating light from different parts of the spectrum depending on the formulation being created. This is a preliminary step to restructure the hydrogen bonds and prepare the medium at that critical point in the process. (Scientists have begun to change bond angles using lasers, focused light, so the mechanism is not esoteric magic, it’s a known phenomenon. However some of the things we do are exactly that: magical. Defined as changing reality according to one’s will. ) If you’ve read this far you probably realize that our approach is always born of, and in service to, SPIRIT. Dr. Jenny Dr. Hans Jenney through well documented studies demonstrated that vibration produced geometry. By creating vibration in a material that we can see, the pattern of the vibration becomes visible in the medium. When we return to the original vibration, the original pattern reappears. Through experiments conducted in a variety of substances, Dr. Jenney produced an amazing variety of geometric patterns, ranging from very complex to very simple, in such materials as water, oil, and graphite and sulfur powder. Each pattern was simply the visible form of an invisible force. These geometric patterns have a three dimensional structure. Sound actually has a recognized form to it. This form is a geometric design. This design has depth, length and height to its structure. This is why the Tibetans refer to geometry as “frozen sound”. The mandalas that ancient cultures drew are two dimensional patterns that represent three dimensional sound. … As we mentioned when speaking of multi potencies: many enzymes in the body have cellular concentrations of 1X10-4M to 1X10-6M. These levels correspond to potencies in the ranges of 2C – 3C. Regulatory enzymes and transfer or communicative molecules have been measured at cellular levels of 1X10-9M – 1X10-10M corresponding to potencies of 6C . Hormone levels are measured or estimated to be present at physiological concentrations of 1X10-9M – 1X10-22M representing potencies of 6C – 12C. These concentration levels within the cells, tissues, blood and fluids illustrate the potential relationships between homeopathic potencies and physiological activities; the relationship continues through the more ‘subtle’ bodies, depending on the potency chords used in the formulation. The addition of the substance, of the mother tincture, along with the more subtle light elements in formulating is important for lasting change and healing. Balancing/healing only in the etheric or focusing only on the electro-magnetic can temporarily improve, but not remove, the underlying cause of imbalance The true blueprint is not etheric or electromagnetic, it is literally multi-dimensional and must be addressed so. Besides a silly lumping together of different emerging technologies based on different theories of physics it’s simplistic and incorrect; to suggest an exacting on the field of earth shows a misunderstanding of vector physics. With that kind of misinformation apparent we wanted to include some information about scaler waves, so you can understand the phenomenom for yourself. “Stoney and Whittaker showed that any scalar potential can be decomposed into a set of bidirectional wave pairs, with the pairs in harmonic sequence. Each pair consists of a wave and its true time-reversed replica. So, the interference of two scalar potential beams is simply the interference of two hidden sets of multiwaves. That the waves in each beam are “hidden” is of no concern; mathematically, scalar potential interferometry is inviolate, in spite of the archaic assumptions of classical EM (When Maxwell wrote his theory, everyone knew that the vacuum was filled with a thin “material” fluid — the ether. Maxwell incorporated that as a fundamental assumption of his theory. In other words, the scalar potential Phi already consisted of “thin fluid”.). If you sit within a square structure and feel…then within a harmonically constructed pyramid…then within a tetrahedron; you can feel the different effects created by the angles and, if you move around, your relationship to the angles within the given space. Angles are part of the alphabet of the Language of Light. This language is multidimensional and is reflected on the molecular level as well as the subtle. Ascension Alchemy® formulations work on the molecular as well as the more subtle to effect deep and lasting transformation. … A good deal of information follows loosely relating to our formulas and approach by third parties, some by our customers. Given the length and growing amount of information on this website we would suggest this would be the LAST section to read. We only include it for those of a technical nature who enjoy such. These were imparted as the primary frequencies prior to the sound–the frequencies that create the sounds, the notes that you would hear–so literally crystal clear communication directly to your cells rather than through yourears and avoiding the secondary distortion that will always take place depending on the instruments or quality of the voice(s); the recording as well as listening medium etc. Company : GESUNDHEIT, Laboratories & Pharmaceutical Sdn Bhd, Leader In Electronic Medication. Original The One TM is a function food product that is produced using electronic medical technology that is able to help increase health level and cure various types of illnesses totally. It is produced from energies that are extracted from ingredients. Which their effectiveness has been proven in helping to improve health level. The effectiveness of these ingredients has been approved by health and food expert from all over the world. Energies that have been extracted are put together into three types of radiation, which are Alpha, Beta and Gamma Ray to enable them to take charge of all situation of critical illnesses, imbalances, deficiencies beside having the ability to cure up to the cell level. The function of Original The One TM are divided into four compartments that are combined to work as the end product in helping the process of curing various illnesses, activating organ function and increasing health level as a whole. Below are the compartments that are found in Original The One TM. – Lyngze – Avena Sativa – Brahmi – Capsicum – Caviar egg – Spirulina – Ginseng – Mengkudu – Gamat – Honey – Royal Jelly – Tongkat Ali – Chistosan – Kacip Fatimah – Allium Cepa – Allium Sativa – Air ZamZam – Propolis – Bee pollen – Polleny – Germanium Metallicum – Gotu Kala – Gingko Biloba – Multivitamin – Oxygenated Water – Chlorophyll – Nigella Sativa – Ubi Jaga – Dong Quai – Rasberry – Aloe Vera – Hormone – Hydrocotile Asiatica – Kiwi – Blackcurrant Orange – Chamomile – Broccoli – Habiscus Sabdariffa – Manjakani – Damiana Tenera – Others. The effectiveness of these ingredients have been proven as able to increase health and have been used by health and food expert from all over the world fot centuries. The ability of electronic medical technology in converting the gist of the ingredients into energy form has enabled the energies to be supplied simultaneously to increase health level totally. Contains energy that is extracted from heal cord to help cure all types of illnesses and their sources that have been identified by medical expert from around the world. Original The One is able to help curing various illnesses especially from sources such as Miasm Cancer including Benign Tumor and Malignant, Miasm Gonorrhea, Miasm Syphilis (hereditaru or infection), Miasm Psora, Miasm TB, virus, Herpes Bacteria, Fungus, Psychology, Blood, Organ dysfunction, Toxic and Poisoning, Trauma and Accident, Hormone and Imbalance Vitamin. Arthritis General – Leukemia – Anti Cholesterol – Mental Imbalance – Influenza – Arthritis Rheumatoid – Arthritis Osteo – Arthritis Tuberculosis – Arthritis Infective Polio – Asthma general – Asthma Cardiac – Asthma Thymic – Allergy – Diabetic Mellitus – Diabetic Insipidus – Diabetic Insulin Dependent – Psychological – Skeletal System – Muscular System – Nervous System – Circulatory System – Glandular System – Chicken Pox -…. Pain is the main reason that causes a patient to see a doctor. Pain is also a symptom shown buy one’s body about the illness that need to be medicated and cured. The normal approach would be taking painkiller pills that contain drugs to ease the pain. This approach is actually not medicating but it is just retraining the illness symptom to eliminate pain. The use of painkiller that contain drug causes the Central Nerves System to not to function properly and unable to provide information that happen in the body. The sources of illness that is not medicated and detected by the Central Nerves System (due to drug-based painkillers) will make the illness more deteriorated without noticing it. The use of these ingredient (drug based painkiller) would weaken one’s Central Nerves System that function to control the whole nerve system in the body. The third compartment in Original The One contains energy that is specified to eliminate pain without using any chemicals, drugs or toxics that could cause side effects. To overcome pain or illness that emerges in a sudden, drink Original The One together with Booster three times in a row for every 15 minutes. Then continue the consumption according to the suggested frequency and dosage. Contains energies of more than 100 additional food pro, vitamins, and nutrient that are needed to sustain beauty, natural young look and delay the aging process. It is able to activate the regeneration of skin cells, help eliminate aging symptoms, activate healthy skin and strengthe skin immune system. – Put 2-3 drops of Original The One and Booster into a glass of water and drink about 3-5 times a day. – For illnesses that emerge in a sudden such as fever, cough, headache and others, drink 3 times in a row for every 15 minutes and then continue with the normal frequency. – For chronic patients, put 2-3 drops of Original The One and Booster into a glass of water and with only one tea spoon, and drink 3-5 times a day. – For maximum synergy impact, drink Original The One together with Electro Clustered PI Water that consist of the fifth compartment that acts to medicate and activate problematic organs. The usage of Original The One might cause aggravation or healing crisis as a part of medicating and healing process. If it occurs to you where your old illness reoccurs or the current illness becomes more painful or some changes on some physical part (toxic discharge in the body), do not panic. They are only temporary healing crisis. – Prevent from hand touch – Do not take drinks that have caffeine such as coffee. Do not also use ointments that consist of camphor. – Do not store at places that are near to electrical sources or equipment that have high frequencies and magnetic fields such as television, computer, radios and others. – Store in cool and dry place – Follow the suggested usage. – play white noise into one coil, sense the modified white noise via the other coil. A sort of “water-core transformer,” with the water containing the chemical being studied. – transmit the “modified” white-noise to a distant location (or record it, then mail the recording to the distant location, or send it as a digitized .wav file over the internet.) Bandwidth must be about 22KHz, perhaps lower. – at the distant location (where cross-contamination is unlikely) play the modified white-noise signal into a coil that’s wrapped around a test tube full of pure water. Shake the tube during this process, otherwise the water supposedly won’t “record” the pattern reliably. – test for presence of the original biochemical. See if the pure water will cause appropriate reactions in sensitive bio-materials. – alternately: play the modified white noise signal into a coil wrapped around the bio-sensitive material itself (such as a lab animal!) and see if it has any effect. # From memory (so might not be totally accurate) : He found that a standard test for staphlococcus would respond to “white noise treated” water as if it had a certain chemical in it. Also, guinea pig skin capillaries responded to an acetylcholine “treated” water by a visible dye response. Also, live guinea pig hearts responded to another type of “treated” water as if a chemical was actually present. One problem: his tests rely on highly sensitive chemical reactions which are triggered when trace amounts of certain materials are present. The “signals” impressed on the water give a reliable but WEAK effect. I was wondering if the signal for alcohol could be impressed onto water, and then the signal could be played into a coil wrapped around a human body to cause intoxication. 🙂 If the effect is tiny, this wouldn’t work. Speculative weirdness: wind the two coils around a human head, play the pure white noise through it, then send the resulting signal into a coil wrapped around ANOTHER person’s head. Like bad 1950’s sci-fi movies! would we get telepathic communication? Or would the personality of the “transmitter brain” overwrite the personality of the “receiver?” 🙂 Repeat the experiment using a human and a duck, or use a fresh corpse, Dr. Karloff. Or more seriously, can the water microstructure of a healthy person be used to strengthen somebody who’s weak and sick? OK, try to transmit diseases or disease-immunity over wires. Maybe cause a developing frog egg to grow up into a chicken? Or can the chemical structure of a youthful body be used to rejuvinate an elderly one? double 🙂 ! # Suggestion: extract the difference signal between the original white noise and the sense coil. Does the difference signal measurably change when various chemicals are passed near the coil pair? If so, then examine this signal with a spectrum analyzer to look for resonance lines associated with various chemicals. The culprit in these differences from literature turns out to be water’s ability to reorganize about charge. This new bulk picture of water has been configured to shed light on the 6-9 eV photoionization process in water. New gas phase work on the role of electronically excited states of dissociating H_3O Rydberg radicals (from electron transfer reactions) will be presented. The role of electronically excited states of the H_3O Rydberg radical will be discussed regarding both the presence of water molecules in interstellar space and the photoionization charge separation process in water. Jerry led them further into the mountains than they had ever explored before, Come on, it is back there on the cliff wall, he called. The men climbed and skirted around the drop offs. Past the rugged areas they saw what looked like a gradually rising slope that ended at a rock cliff or wall. As they looked out over the valley below them they could see the water line of an ancient inland ocean. They were pretty near the line where they stood now. As they climbed the slope they realized that they were not walking on a dirt or natural rock slope. They stopped and felt with their feet and then their hands until they found the edges of what they realized were steps cut into the rock but now reclaimed by nature, were covered with pieces of rocks and dirt and foliage. Reaching the top, they saw them. The pictographs. Well versed in ancient languages from around the world, Jerry and Vernon paused and then interpreted the pictographs. Vernon had heard the ancient legends about the Temple of Regeneration. This was where the ancients held ceremonies to teach and then when the time was right with the individual they were given Gold to drink. Vernon had tried for years to determine what that meant. He had read the accounts of Moses telling Aaron to burn the golden calf and give it to the people to drink. He had studied the legends and myths of Salamanders, Maronis, and dragons. He had studied endlessly to break the alchemical codes to turn lead into gold, knowing that it was not the shiny metal that the alchemists sought. Now he was standing in the place where the myths and legends had started. A Temple of Rejuvenation. The two men skirted the wall and followed passage ways in the rocks and read more. The walls told the story of the initiate. Each 100 years a suppliant would return to learn the next step in his progression, take of the golden water, be physically renewed, and return home to practice what he had learned and to perfect him/herself to the next level. Then return. Nine times they could return. At the end of the rites of passage if transcendence did not take place the seeker would return to his life to die a natural death. He would then be reborn to experience earth life as a mortal until the spirit would drive him to seek the opportunity again to transcend. At that time an initiate would find him/her and introduce him again to the lessons. Lightening, the men said in unison. They used a gold lightning rod and called down fire from heaven. This area is an earth vortex and thunderstorms are common here. Vernon said. Armed with that information, and seeing the sky was darkening with the usual afternoon thunderheads, the men headed for home. To reproduce lightning is an awesome task. The amount of electricity is quite staggering. That, and then there is a component to lightning that is not in ordinary electricity. This is where Cal came in. When he was 8 years old he had seen a strange machine built by an even stranger man who wandered into a mining camp where his father was working. When he grew up he went back to that old camp and took the old machine from the mine. The machine did not work in the normal fashion and Cal remembered that he had seen the old man make a battery for it. Back to the mine. Where was the battery? When he found it, he analyzed the left over residue for clues as to what was in it. Even after finding out, recreation was elusive. Enter the fourth man to assist in the birth of Beyond Monoatomic  Lamar. Lamar was another personal researcher who had read about the monoatomic work of Dave Hudson http://www.aethericenergy.org/elixir.htm , including the 23 different chemical processes that it takes to reduce metallic gold to monoatomic gold. He had found that he could reproduce the effects of the M state elements without chemistry by just using furnaces in special ways. When Cal told him of his problem they got together and created a battery with monoatomic elements out of his new discoveries. Putting together a copy of the original machine with the battery in line, they found that the machine created a very strange output of energy. There was a component to the electricity that they had never seen before. He tried, quite unsuccessfully, to tame it and finally used the biggest resister he knew of  distilled water. At the end of the day, when the experiments were over and the machine turned off, Cal reached for the glass of water to drink because it was hot in the shop. When he put the glass to his lips he received a jolting shock. Static electricity buildup, Cal thought. When the shop was clean, he came back to finish his water. Another shock, the same hardness as before. This was not supposed to happen. Being diabetic, that night when Cal checked his blood sugar it was down dramatically. Marveling but not putting the water and blood sugar together, he went to bed. The next day, he followed the same procedure and at the end of the day drank the water again. Again, another shock. Now he was having fun. This is not supposed to happen. And it was quite a novelty, but that night the blood sugar took another large drop. The light went on and the next day the experiment began. The blood sugar normalized itself and he started giving it to friends with serious problems. Nearly everyone who tried it found that the water not only had the ability to change diseased cells to their normal status, the energy level increased, shallow sleep patterns reverted to the normal deeper, more refreshing kind, and hormone production normalized. Putting the two processes together created a union between the Aetheric Gold (or silver, or platinum, etc.) and water. The same as the temple walls described. And the result? DNA analysis revealed that the aging process was slowed, or stopped and, in some cases, reversed. Aetheric, beyond monoatomic, just pure life. Living Water has been a field of research for me going on 20 years. My first introduction to the amazing power of water began then with these words from my great friend, Billy Joe Spurlock, “water will become the most important thing on Earth”. If Billy Joe said so, I knew it was inevitable. Billy Joe is one of the world’s foremost astro-physicists, specializing in nuclear wave theory, and it was he that told me many things about the ancient science of Atlantis, Lemuria, and MU. Billy Joe worked directly with Werner Van Braun and Albert Einstein. Billy Joe, and his associates sought to harness an understanding of how our universe works and to use the knowledge for the good of mankind, not like many that took the knowledge and used it for war and enslavement. Over the years we have worked together in research, proving many of Billy Joe’s scientific methods. If you have trouble believing in the power of water (important to have salt also), then I recommend that you read what Dr. Fereydoon Batamanghelidj, M.D. has to say at at this website: , and read his book, “Your Body’s Many Cries For Water”. While living in Montana, I had the great opportunity to meet Dan Nelson (I don’t believe in coincidence). He had a great interest in water as well. And at that time he was still collaborating with Lloyd Mear. He had just begun to share the early versions of his enhanced water. I tried some of this water for myself, having recently had my own “near death experience”, and sought to give it a try. I have to say that I owe a great deal to Dan Nelson for being here writing this for you at the beginning of 2006. The result of our meeting several years ago, the best water in the world (not just my opinion, many other researchers agree) was officialy labeled and on the market. I volunteered to do the graphics and design for the label in accordance with the guidelines I was told would satisfy the FDA. After 2 months of changes with the government of the State of Utah, I finally obtained approval for the first label for Dan’s water so that it could go on the market. I called it “The Water”. It has gone through several upgrades since that time, especially with Dan’s new invention that he initally called the “Virtual Photon Laser”. The laser, together with specific mathematical/geometric formulas, encodes the oscillating resonant energies or “information” in The Water by creating fractal patterns that remain in motion in The Water. Later on, I interviewed Dan Nelson http://www.rangeguide.net/research.htm , and my friend, Gloria Thiede transcribed the interview so that it could be published. Soon after the interview was published on my website – Range Guide http://www.rangeguide.net/ – the news went worldwide, and interest began to mount exponentially. I’ve been marketing the product wholesale for $35 to my club members ever since, and many have changed their lives for the better as I did by drinking The Water. The “concentrate” makes at least 8 gallons for drinking. No specialty water compares when it comes to maximum hydration of cells quickly. Dan Nelson and Lloyd Mear collaborated on the formulation of The Water back in 2001. Dan Nelsons previous experience with technologically enhanced water began with his use of Patrick Flanagans Crystal Energy concentrate based on silica micro-clusters with high surface zeta potential. One parameter of Patrick Flanagans water, which has never been discussed, is the molecular spin-state expressed in bio-angstroms. The bio-angstrom reading is indicative of the actual water particle configuration. For example, low spin-state (quantum-state) water is composed of fundamental water particles, which are quite large by molecular standards and are actually micron sized particles. Flanagans Micro-clusters in water generated an impressive spin-state of 7,500 bio-angstroms when diluted according to his recommendations, whereas most drinking water rates anywhere between 3,000 and 6,000 bio-angstroms. The water inside all living cells clocks at 8,500 bio-angstroms. Water such as Flanagans Crystal Energy rates a lower interfacial (surface) tension of 59 dynes/cm as opposed to the nominal 75 dynes/cm of most tap water. These facts have been greatly misunderstood and misinterpreted. Lower interfacial tension, while making water a more efficient solvent and wetting agent, does not make water a more efficient hydrating agent. Water must enter the cell through active protein channels in the cell membrane wall called aquaporin. Despite the state of the art achievement of Crystal Energy in lowering interfacial tension, Flanagans technology only resulted in a 15% reduction in micron sized water particles to particles in the nanometer range. Micron water will not traverse the cell membrane wall by virtue of its size. The aquaporin only allow for the passage of the nanometer sized constituents of ingested water through the cell wall. Dan Nelsons development of a new class of laser, which he now refers to as the Geometric Laser, makes possible the total engineering of a given volume of water to achieve a 100% conversion of the fundamental water particle to sub nanometer size. This water actually supports no water particle larger than (.4) nanometer. This is achieved by energizing the water with energy turned back to the water from vacuum space around the particles. In other words, the Geometric Laser exposes the water to negative entropy (reverse thermodynamics) and places it in a high quantum state. One of Lloyd Mears associates with a PhD in geophysics referred to this engineered water as gyro water. Dan responded by agreeing with the terminology as long as it was understood that gyro was simply a metaphor for the permanency of the spin state properties imparted to the water by the Geometric Laser and not to some nano technology aspect. Any water exposed to the Geometric Laser assumes a minimum spin state of 1.8 million bio-angstroms. The athletic performance enhancement water that was produced jointly by Dan Nelson and Lloyd Mears clocks in at 12 million bio-angstroms. This water has a measured interfacial tension of 20 dynes/cm. However, the extraordinary hydrating properties of this water can be attributable, not to the reduced interfacial tension, but to the breaking down of the fundamental particle size to the sub nanometer range. These minimally small water particles now impart new and amazing properties and capabilities to water which must be experienced to appreciate. The science of thermodynamics involves the movement of heat – the reversible transformation of heat into other forms of energy such as mechanical energy. The first law of thermodynamics deals with the conservation of energy. The second law, commonly referred to as the entropy principle, refers to the degradation of the total energy in a system. Normally, entropy would be a microscopic variable describing a bulk property of matter – a quantitative measure of how disorganized a physical system is. So the second law says, for any “closed” system, the entropy (magnitude of disorganization) always increases. First of all, the law of entropy increase is statistical, not absolutely certain. According to the laws of quantum mechanics, at the quantum level there is said to be time reversibility, things can happen in any direction. The arrow of time can point in either direction for entities on the atomic/molecular scale. On the micro level, nothing seems to have a preference for one movement of time over the other. Forward or backward time movement is irrelevant to a molecule until we make the transition from thinking in terms of chemical thermodynamics to thinking in terms of quantum thermodynamics. Entropy can decrease in an “open” system. An example would be the ordered deposition of ions in a crystal lattice. The manifest growth of order is decreased entropy. Water enjoys the status of being an “open” system in its liquid phase. Liquid water is in an uncondensed phase. Heat transfer decreases entropy and water by shifting it into a condensed phase via the deposition of molecules in the ice lattice or the highly ordered fractal pattern of a snowflake. All three states of water (liquid, bulk, ice-fractal flakes) represent what would be considered highly coherent quantum states. Water is actually a crystal (so are we) in its uncondensed/liquid phase. Instead of phase shifting water to its condensed phase, we have developed a unique approach to decreasing the entropy of water while locking it into its uncondensed phase. This approach brings about a substantially higher coherent quantum state regarding liquid water. This involves the restructuring of water’s crystalline molecular units into substantially smaller units. Supporting these smaller molecular units is the proprietary function of quantum thermodynamics. Water, as an open system, is exponentially susceptible to the quantum state of the vacuum medium or what is often referred to a zero point energy. Bringing any pure water to a higher coherent quantum state and maintaining it there requires the manipulation of quantum thermodynamics. This is accomplished with a unique Laser that actually produces a time reversed particle wave. Technically, this is a virtual particle wave running in the near ultraviolet end of the spectrum. This laser has a higher degree of phase coherence (by a factor of 100) than a conventional EM laser no matter where the EM laser is running in the visual spectrum. The virtual laser imposes coherence (structure) on the vacuum medium around and through a given volume water and rotates energy out of vacuum into the fundamental water molecules. As entropy decreases (time reversed energy always runs thermodynamics in reverse) water physically expresses this by reorganizing fundamental particles to acquire a higher coherent quantum state. The molecular units jump from the lower (ground) state in mathematical predictable quantized stages with different crystalline shapes of progressively smaller size. This technology has exceeded in reducing micron size particles to less than one-half nanometer. In considering our product, remember that what you start with has a lot to do with what your end product becomes. The Water starts out with a base water that comes from an ancient aquifer 8,000 feet below the surface. Out of approximately 5,000 samples from around the world, this water was selected as the best water in the world to use as the base water for making The Water. The base water is called “Pure Telluride” (from the Telluride, Colorado area). All bottled waters are not created equal. Pure Telluride Natural Spring Bottled Water comes from a spring deep in the Colorado Rocky Mountains. This natural spring water is known for its smooth taste and well-balanced mineral content including a high level of H- (H negative), a youth preserving anti-oxidant. Bottled at the source in the mountains overlooking Telluride, this natural spring water is filtered for centuries through volcanic geology. Information reported by the United States Environmental Protection Agency reports that in 1999, there were 27 million Americans using tap systems that violated health standards. The majority of those health-based violations were for bacteria contamination. Some of the violations were due to chemical contamination. What are you drinking? Do you know what’s in your water? Modern filtration and purification treatments have rendered water void of natural elements. Szent-Gyorgyi, in his book Pathology of Water, made the association that muscle tissue, cartilage, connective tissue, including skin, aged or became less pliable with time due to lack of good water provided to cells and tissues. If you are interested in purchasing Pure Telluride to use with our other products or to drink alone, we have it available for drop-shipment to your door. Remember, it’s already in The Water (the base). March of this year , Dan completed construction of his new laser and another new water enhancement device, and the result is that instead of using 8 ounces in your drinking water [1 gallon], one only needs 2 ounces. Now, we are shipping a 16 ounce bottle that do the same job [and then some!] as the previous 2 liter bottle originally produced for Range Guide Expiditions. The Water is truly a legendary product, unsurpassed in the field of specialty water. Also this year, I am working with Dan in a collaborative effort to produce another separate upgrade of The Water that includes my product called “BIONAID”. BIONAID is a specialty water that has a very interesting particle called “Bion”. It has been researched in labs for over 15 years, and the results are unsurpassed regarding products with non-colloidal [under .004 microns] silver nano-particles. The process that makes BIONAID results in creating an incredibly small particle consisting of an atom of silver covalently bonded with an enormous amount of oxygen atoms that results in producing all the desired health enhancing aspects of silver without all the worries of colloidal silver. We are continuing research with adding BIONAID with The Water, and so far we have seen the addition of The Water reduced the silver ppm’s in BIONAID from 2.83 to 1.14 ppms. BIONAID, like The Water, is so rich in it’s constituents and properties that it can be diluted into drinking water the same as The Water, i.e., 2 ounces per gallon. Again, we highly recommend mixing The Water and BIONAID with Pure Telluride, or at least the best drinking water you can find. While we do not [and will not] use “doom and gloom” to sell products to our members, we believe that it is very wise to always have plenty of our specialty water on hand for emergencies. We are continuing to see that pure, living water, especially enhanced specialty water like The Water, is rapidly becoming the most precious substance on planet Earth. We only want the best, and we endeavor to bring the best to you and your family. We realize that our products are not cheap, but we prefer natural alternatives, for ourselves, over the soaring costs of questionable drugs and their side effects. Our personal goal for ourselves is never being in the position of having to rely on third-party health care – just do what it takes to maintain our health ourselves and place that responsibility upon our own shoulders. And as time has proven to us over and over again, we, personally, have faired much better in the long run for taking this position. Nevertheless, this information is not intented to replace the advice or services of “health care professionals”. Likewise, the opinions and information here have not been evaluated by the FDA, and come soley from our personal experience and research. We make no medical claims and never will. The results of these products vary from individual to individual as we are all unique and have our own unique challenges, and some things take longer for some of us. The Water is $35 per 16oz bottle/$360 per case [12 16oz bottles]. One 16 ounce bottle, adding 2 ounces per gallon of drinking water makes 8 gallons of mix which normally lasts for a month. My own personal experience with The Water taught me to respect The Water, so I start out the first few days with only 1 or 2 8oz glasses of the mix. Please realize that we all have been accustomed to very dead and/or recycled water, and even water from wells and springs are greatly lacking in essential properties compared to Pure Telluride. So do not be suprised if you notice detoxing effects along with the energetic feeling that has commonly been reported by users. At the very beginning, a few years ago, I drank it straight and felt so good the first couple of days, but then all that energy and cleansing power really began to break out all those toxins out of my body very fast, including toxins in my head, that NEEDED to be removed, and I had a dull headache for a few days. It was worth it to me, it saved my life. This proved to me right at the beginning that I had something very powerful and effective. Now that the product is even more powerful, it is best to start out a little at a time and see how you do, then add a little more as you continue to monitor your body systems. There has never been any need to drink more than 3 8oz ounce glasses of the mix a day. Again, the water molecules are so small that they penetrate living tissues very effectively, especially with the high spin energy too. If the water got any smaller in this product we’d be selling gas instead of liquid. Water is the universal solvent, so one should expect to have their bodies cleansed by this water. Dan recently measured the energy field emmanating from The Water and he got energy readings 470 feet away from the bottle. Presently it is also measuring to around 76 million bio-angstroms. Along with what Dan has done, I have also employed “HADO”, as developed by Dr. Emoto and associates, and ancient “Light Language” to The Water, making this product exclusively unique from the water products of other people that sale Dan’s water under other brand names. Remember, “The Water” is the original and we are the ones on the cutting edge in water technology. And as mentioned, BIONAID is also being added. Therefor, The Water sets the standard in specialty waters world-wide. # Magnetic Water Softening: Does It Work? Magnetic research for applications with water has evolved to everyday applications. You can go down and buy water softening systems that use only magnets  usually hexagonal  instead of salt to soften the water. But there is a problem with magnetic water softening. The magnetic field that suspends molecules in the water with other molecules is destroyed as the water moves through pipes. I have witnessed how magnets clamped on the water pipes at the water heater worked perfectly  there was no calcium build-up on the electrical coils  but then as the water moved away from the source, through a pressurized pipe, it became became harder and harder. After traveling through about 20 feet of pressurized pipe, the magnetically softened water I observed had lost roughly half of its softness, and after about 50 feet, the calcium buildup was the same as when there was no softening device in the system. So in order to work, magnets need to be on each and every outlet, which is an expensive proposition. # Magnetic Treatment: Is It Good for You? Is magnetic water good for you? From everything I have seen so far, the answer is no. The one exception that I am aware of is products made by the Nikken, a company that seems to understand the relationship of magnetic fields to the human body. But still, I am not yet certain. # Turkish Water to Heal the Environment:As simply as it may have seemed to use this water to heal the rivers, lakes, and even oceans of the world, it has become clear from my interaction with the Turkish water that this will probably never happen, at least not coming out of Turkey. There has been deception here, and so my suggestion is to be very careful, especially if you are thinking about investing money or energy. # Water and Zero Point Technologies: This one is for the future, but so many of you have asked about this information that I want to say something here. Perhaps one of the greatest uses I have seen of water is its ability to tap into zero-point energy. With water and water alone, I believe it is possible to tap into a near-infinite source of energy. It’s worth your while to study carefully the free-energy water machine of Victor Schauberger. During World War II, Schauberger invented a machine containing only water that was not only reused indefinitely to produce free energy, but that opened the real possibility for space travel. I have seen enough to know that the Schauberger device is real and that Schauberger’s technology will probably someday be the rule. A small model, only 9 inches high and 18 inches wide, produces 2,000 horsepower  forever! Our government has the plans and has even patented essential parts of the invention to keep it out of our hands. But it is inevitable, because it is so simple, that one day Schauberger’s technology will belong to the world. The best part of this machine is that it seems alive, and everything near this machine when it is operating becomes healthy and feels complete and whole. It operates only from the movement of water moving through Sacred Geometrical chambers. Dr. Lee Lorenzen discovered how to make a type of primal water that is necessary, as I see it, for life to emerge for one level to another. It is called clustered water, and is being studied all over the world. When a baby is born, its body is filled with clustered water. It must be important and primal, for this is the water that is present at our beginning. Further, the DNA molecule, down the center of its core, also is filled with clustered water. Again, we are looking at primal source. So what is clustered water? Under certain conditions, water can form awesomely beautiful six-sided crystals. Water that has these crystals, according to Dr. Lorenzen, is alive. And so you can buy these crystals  usually frozen and concentrated  from his company. The only problem is that they are very expensive. It would cost you al least $50.00 US a month just for your drinking water for each person. Dr. Flanagan is an extraordinary scientist and a man who should be listened to. His work in energy fields opened the world to new ways of seeing. And his work in understanding water has been impressive. But we spent three years studying Dr. Lorenzen’s water, and so we still have not had enough time to do the actual “street work” for studying Dr. Flanagan’s work. However, I have listened to more than fifty people who have tried Dr. Flanagan’s Micro-Crystal water and who tell me it is excellent. I doubt if you will have a problem with this one. Dr. Lorenzen’s water was imported into Japan by Nikken, the magnet company, for many years. Then they decided to create a machine that would cluster water that could be drunk immediately. This solved one of the constant problems that Dr. Lorenzen experienced in the beginning: How to ship frozen clustered water without destroying the product from over heating. And so the machine was called the Pi machine and now sells for about $800.00 US. However, this is another product we have not yet tested. If someone wants to donate one, we will test it. Again, there have been no negative reports, but the clustering is achieved, as we understand it, through the use of magnets. This is another water that we have not yet tested, but you keep asking about it. I do feel that it has real promise, because so many people are reporting that it has really helped them heal their diseases and make them feel and look younger. Also, Prill water is not expensive. Once you make your first gallon, you can siphon off 3/4 of the water for drinking, and then fill up the old bottle full again and have another 3/4 gallon the next day. It becomes free. In the Turkish Water, I saw the possibility of the Earth’s being able to heal herself from the poisons that have plagued her. The initial tests I saw in Washington, DC, appeared amazing and showed incredible promise. But it was very clear that this promise applied only to environmental applications. At no time have I ever felt that this was a water that people should actually drink. It does not make sense to drink this water, since it breaks down hydrocarbons, which is what the human body is made of. People have taken my words out of context and falsely claimed, on many Internet sites, that I am in favor of drinking this water. I feel that these sites are using these distortions of my words to make money for themselves, without caring about people. To be clear, I ask that you do not drink this Turkish water until there has been very careful, long-term testing by the FDA. I have reason to believe that it could be dangerous to your health. Let’s get it out into the open, and have this Turkish water tested. Let’s know the truth. As mentioned above, I have seen too many negative reports to suggest even trying magnetic water for drinking. If you have something positive for me, let me see it. Again, the only possible exception is Nikken magnetic water coming from the Pi machine, but still, the results are not yet known. We have tested over 40 waters, each one making outrageous claims. Sometimes they are what they say, but most of the time they are not. # Walter Baumgartner’s egg shaped water vortex machine. The water can be felt immediately when it enters the body. There is no doubt that something is going on. Under the vision of the Kirlian photograph, Walter’s water has a prana field that extends from the glass of water out about eight inches. It is worth a try. # A strange double-vortex machine: Two men in Arizona created a double vortex machine to enhance water. It was impressive and was about the size of a small writing desk. Each vortex rotated in opposite directions and then combined the water. There were several different other functions taking place only fractions of a second apart from each other within the vortexes. The result was a water that was similar to Walter Baumgartner’s in its pranic field. And you would feel this one, too. But when we sent this Arizona water to our lab in Canada, the results were startling. The water was filled with lead! The inventors could hardly believe the results since there was no lead anywhere in the entire device. It was checked a second time and the results were the same. They finally decided to stop selling the devices because they never could figure out where the lead was coming from. Magnetic Water Softening: Does It Work? Magnetic Treatment: Is It Good for You? As simply as it may have seemed to use this water to heal the rivers, lakes, and even oceans of the world, it has become clear from my interaction with the Turkish water that this will probably never happen, at least not coming out of Turkey. This one is for the future, but so many of you have asked about this information that I want to say something here. Perhaps one of the greatest uses I have seen of water is its ability to tap into zero-point energy. With water and water alone, I believe it is possible to tap into a near-infinite source of energy. The following was originally written July 28, 2002, and made available on a limited bases to a few individuals. It is describing a modified Joe cell technology that was called AquaMEGA. Vernon Roth is presently continuing this technology. At night, when the upper cabinet is open for viewing, you can see deep blue lights along with and as bright as white lights streaking in from the top and up from the bottom of the bottle of water. These can’t be seen except when it is quite dark. It’s like something out of science fiction. The above image from another context gives you an idea. The device that creates this aetheric/magnetic water “came to” the inventor in a dream six years ago. It took him three days to build it. The device was actually initially intended to be a Tesla-like electrical generator that pulls energy from the aether. As the inventor pulled together the various components of the device, he needed a resistor. Being the resourceful guy that he is, he pulled out a glass of water and used that for the resistor. To his amazement, the water took on magnetic and electrical-like properties. He has used it for that serendipitous purpose ever since. Soon after getting the device built, it ceased running for quite some time. It took him another three months to figure out how the machine worked and to get it to run yet again. Even so, the machine has a “personality” all its own. If someone comes into the premises who has highly negative emotions about them, the machine ceases to work. People who are “sensitive” to “energies” get an unusual sensation when the machine is operating. When the machine is first turned on, after having been off for a while, it takes about half a minute or so before the aetheric energies begin flowing. Until they flow, the machine generates ozone. Once the aetheric energies begin flowing, the adjoining Geiger counter immediately shows a strong reading from the alpha particles being emitted. These are now shielded by an aluminum casing or cabinet that has water between two layers of aluminum. For the cabinet, the inventor adapted an incubator from a University science department. The machine is in the bottom portion of the cabinet, and the bottles of water to be charged are situated in the upper cabinet. The first piece of equipment in the device is a motor. He used a 3 horse power motor, but that was because that is what was available at the time. He thinks a 1/2 or 1/3-horse power motor would do the trick. That turns a motor he adapted, which is one of the proprietary components of the device. It entails a reconfiguration of the magnets and the coils so as to be able to pull in the aetheric energy. At night, when the upper cabinet is open for viewing, you can see deep blue lights along with and as bright as white lights streaking in from the top and up from the bottom of the bottle of water. These can’t be seen except when it is quite dark. It’s like something out of science fiction. 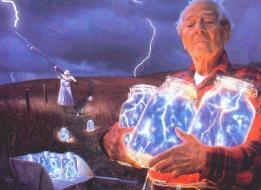 The inventor said that the aetheric energy is very slow compared to electricity that flows near the speed of light. Judging from the timing of how long it takes the aetheric energy to run through his set-up, he estimates that the aetheric energy he is tapping flows at around 2-3 feet per second. At some point, he plans to return to the task of adapting this incoming energy for use in our power grid. It may be as simple as connecting it to a bank of capacitors and then running that through an inverter to convert that DC power into usable AC. Eventually, through a smooth transition, he would like to see the AC power grid replaced by this more natural form of energy that is in harmony with life, not antithetical to it, as AC energy is. The power grid that crisscrosses the land actually blocks the natural aetheric flows of energy through the earth; and when it gets to a critical point, surpassing the earths ability to buffer, we will see some fantastic calamities result. He recommends that all AC wiring be run through the floors (then up to the outlets) and not through the walls, as is usually the case in construction. Speaking of electricity, the power company has paid him a visit twice, wondering why he is only using $20.00 of electricity per month, even though he has a shop in his garage with heavy equipment. They’ve checked his meter to make sure it is working right. It is. There’s something going on there that we do not fully understand yet. Then there are the vortex storms he has over his house. He’s lost nearly 1/3 of the shingles on his roof to micro bursts from storms centered over his house, complete with lightning. One time he had a bunch of boxes in a fenced area prepared to burn them. One of these storms came along, and the next morning the boxes were arranged in a circle around his house. Another time, his friend was standing at the sink washing dishes, some 20 feet away from the machine. When the machine cycled through one of its phases, suddenly she was no longer standing in front of the sink, but was standing outside in a field. She saw people walking in the distance, and houses in the distance. Then the machine cycled through the next phase and instantly she was standing at the sink once again. My impression was that she was not moved through space but through time somehow. These are amazing times in which we live. Originally published Feb. 3, 2004. Slightly modified. Perhaps you thought water could not carry an electrical charge. Well, it turns out that a device that a friend of mine invented has characteristics of extracting aetheric energy from the vast sea of energy that surrounds us and is able to charge water with both an electrical and magnetic charge. We’re not talking about water as a conductor. We’re talking about water having been charged and then dissipating that charge in the form of an arc to your finger. It’s as if the water in this changed form serves as a sort of battery. You may even hear the arc. The arc has stretched as far as nearly 1/2 inch [100,000 volts per inch of arc], but usually is in the range of 1/4 inch or so, which is around 8,000 to 10,000 volts (very low amps). It is that strong when it first comes off the machine that charges the water. But by the time the bottle of water gets to you through the mail, it won’t be that strong, though you will definitely feel it. Guaranteed. It will feel almost like touching an electric fence. If you are with other people, have the first person hold the open “shocker bottle” in one hand, then hold hands with the next person, forming a circle with all who want to participate in the demonstration. The last person in the chain then puts their finger into the bottle. ZAP. Everyone will feel it. Author demonstrates how as your finger approaches the top surface of the charged water, an electrical shock will arc up from the water to your finger just before you touch it. Let it sit for a while (e.g. an hour), and it will do it again. For the best effect, do the demonstration with everyone holding hands the first time around, right after you’ve gotten your “shocker bottle” in the mail, and no one has yet put a finger into it. Each time you do it, the water discharges a bit. If you try again immediately (within a minute), with no time for the bottle to sit between discharges, the arc will be significantly reduced, possibly to the point where you won’t even feel it. But it will still regenerate if you let it sit for a while. Try not to put your finger actually into the water, as this has the effect of discharging the water’s capacity to regenerate, so as to diminish the strength of the arc next time around and henceforth. Just let your finger approach the top of the water, and then pull it back as soon as you feel the arc (quite natural to do so, actually). Doing this will let you get the most shocks from the bottle (show all your friends). Actually what usually happens is the shock causes your body to involuntarily jerk the bottle of water you are holding, causing it to splash onto your finger, creating this discharging effect on the water. For that reason, it might be best just to set the bottle down and put your finger into it. If you submerge your finger into the water, the shock effect will go away all together right after that. But if you then let the bottle sit for a while (e.g. an hour), you will get a small arc off the top again. I just tried a shocker bottle I’ve had for three months, and I thought I had pretty well gotten all the shock out of it, but it still delivered a little zap. I took one all the way to Johannesburg, and it still delivered a good wallop. A second bottle went with me from Utah to Johannesburg and then to New York, where my friend Chris Horianopolous and his friend John were able to feel the arc off the top. They loved it. My friend charges the water inside a regular plastic bottle, caps the bottle, packs it in bubble wrap, and ships it by standard currier services. When you open the package, take the bottle out, remove the cap, stick your finger in, and viola. Shock. While you’re at it, take your Gauss meter, if you have access to one, and measure the magnetic field emanating from the water (e.g. set the bottle on top of the meter). Expect to get a reading of somewhere around 1 to 1.5 Gauss. The earth’s baseline Gauss is 0.4. Take a regular bottle of water, and you will get a reading of 0.4 (no increase or decrease from baseline). Now try this. Shake the shocker bottle, and then measure the Gauss. It will be like normal water (0.4) right after you shake it, but as the magnetic fields in the water begin to align again, the Gauss reading will climb to between 1 and 1.5 Gauss. You can actually watch the reading on the meter climb. Take a Kirlian photograph of your fingers before you drink the water, and then again about 5-10 minutes after you’ve drunk the water. The regions around your fingertips touching the surface of the lens will develop much brighter after you drink the water. My friend also has developed a process of adding minerals to the water in a minute crystalline form (he is presently having an AA test run to see if it is actually monatomic — but he will not be advertising that fact if it is confirmed, as that word is as loaded as the word “cure” when it comes to FDA regulations). A typical colloidal silver solution from a local health store measures around 12 ppm. My friend’s silver solution measures around 80 ppm. I was in his home when he showed the meter go up to 120 ppm. If you have a device that can measure such things, go ahead and test this water (if you didn’t order the distilled only version). You can expect a reading of around 80 ppm. When the water is being charged, the machine/process emits alpha, beta, and gamma particles as well as ozone. Physicists and chemists ought to be drooling over this one to find out what is happening on the molecular and atomic level. Unfortunately, my friend is very reluctant to entertain people who are wanting to find out about his device. He is into this for the health benefits that people are realizing from drinking the water, and he doesn’t want to be distracted from that mission that he has been pursuing for six years now. Furthermore, he values his life and wants to continue unabated, so he is very low key about things like this. I should mention that the regular 2 liter bottles that we sell have been run through a “discharge” cycle that keeps the magnetic properties in tact while mostly eliminating the electrical phenomenon. These bottles will still sometimes deliver a little shock, but it is nothing compared to a shocker bottle that hasn’t been run through that cycle. For now, you’ll just have to be satisfied playing with the end product — the water. That is unless I know you well, then I might be able to arrange a meeting for you with my friend. My friend agreed to let me do this special promotion because I convinced him that it would introduce the product to many people who could benefit from the health aspects that it has to offer. He is not interested in flash-bang sensationalism. With so many scams circulating among the free energy crowd because of the potential money involved in the trillion-dollar market, I thought it would be nice for people to have a hands-on demonstration that there really is something going on that defies present models of physics. Tero a person I have high respect for has emailed me concerning the charged water presentation. Here is his opinion on it below…..
Quote: As far as the “shocker bottle” is concerned I think the charge exists in the plastic bottle itself. You know what’s an electret? It’s made by putting a piece of plastic between two conductor plates. First you heat up the plastic and then apply a couple of kV of high voltage across the plates and let the plastic cool down. That gives you a piece of plastic that has charge all the time. I think the same is happening to the plastic bottle in the “shocker bottles”. You could put the plastic bottle in boiling salt water and also pour boiling salt water inside it, apply HV power supply terminals to the salt water on the inside and outside of the bottle, and let the water and the bottle cool down. Or you could substitute the outer salt water with aluminum foil. “I will say though, I have experimented with these bottles quite a bit and I have found that most of the charge (90%) resides in the plastic bottle itself “. Many months ago, I purchased the book “Occult Chemistry” and I have been studying it since then. 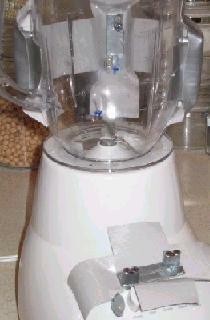 My studies lead me to design the magnetic blender shown below. This is a simple modification to the Sumbeam 4141 blender ($14 at discount stores) or any similar blender to allow it to magnetize water so strongly that the ORMUS matter in the water becomes highly charged. This project requires 16 cylindrical magnets such as those from , stock number D48, NdFe rare earth magnets arranged outside of the plastic blender container. Each magnet has poles on the flat ends and measures 1/4″ dia. X 1/2″ long. The magnets cost under $20. The magnetic assemblies consist of 4 magnets and 2 steel mending plates measuring 2″ X 5/8″ X 1/16″ (available at most hardware stores) which are configured as illustrated below. Also see the picture of the blender above with one of the magnetic assemblies removed from the blender and sitting on top of the blender speed buttons. The size and orientation of the magnets is crucial to the effectiveness of the blender charger. The polarities of the 4 magnets are written in blue at the ends of the magnets, 2 plus at one end and 2 minus at the other end. The end of the plate assembly that holds the magnets labeled + is called the positive end of the plate assembly. 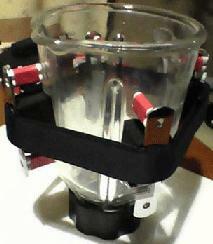 The 4 assemblies are mounted vertically, magnet side in, and equidistant around the outside of the blender bowl (In the original prototype above they are held in place with duct tape). They must be mounted away from the spinning blender blades – above the 8 and below the 24 ounce marks on the blender bowl. They are oriented so that a positive end on top alternates with a negative end on top as they are attached around the blender bowl. The starting water can be distilled water with Celtic salt added at a rate of about 300 parts per million (300 mg of salt per liter of water). It can also be any electrically conducting mineral water. It will be the ORMUS in the Celtic salt and in the water that will be charged during the blending. However, the starting fluid can also be concord grape juice and indeed many other combinations of electrically conducting liquids. Typically, 1 liter of liquid is blended at high speed for 3 minutes to produce the effects of the ORMUS charging. Here are some of the results observed so far. I put 300 mg of Celtic salt in 1 liter of distilled water (does not affect the taste much), a few drops of Tamahi Calcium (which is probably some kind of “ORMUS gold”) and ran this in the blender at high speed for 3 minutes. The first time I took this, I had a strong rush after only 10 minutes and ALL my joint pains vanished right there and then and never returned. That was weeks ago! I drink this water full time now and the best description of the experience is that it is “as if” my little finger tip is in contact with my little toe and the two of them are communicating at dizzying speed, if that makes any sense at all! I sleep less and wake up more rested. My outlook is more positive than before starting the magnetized water regimen. I have been watering some plants with magnetized water over the last few weeks of frost here in the South. The magnetically watered plants have been blooming in spite of the frost while the regular plants are loosing leaves. It’s like night and day! In another experiment, I took 1 liter of cheap wine, rather bitter and rough on the palate, added 300 mg of Celtic salt to it and ran it through this magnetic blender for 3 minutes! What came out was a totally different liquid. It was thick, smooth, almost “oily” on the palate, sweet and heady, like the most expensive European dessert wines that achieve the “slick” mouth feel with a ton of sugar. This modified wine seems to put alcohol in my bloodstream way faster than the starting wine, too! I have also done this with grape juice, with similar results, but without the negative side effects of the alcohol rush! It is interesting to ask why this works so effectively. One surmise would be that the coherent vibration of the ANU in the ORMUS, induced by the magnetic blender, may be creating a collective high intensity field resonance that could dislodge the ANU from being localized inside a single molecule and allow the ANU to become free to “roam” the entire bulk of the liquid, thus causing quantum coherence over the entire container. The number of ANU that are “liberated” in this way seems to grow with the length of time that the liquid is being processed and with the concentration of seeding minerals. Because I got such a strong rush after 3 minutes of processing, I have not yet tried to ingest water that would have been processed longer or with more minerals in it. A more detailed discussion of the theory behind the powerful effects of the magnetic blender is given in an accompanying article called S2 Chemistry and ORMUS , also on this site. In a related enterprise, I have developed a commercial version of the magnetic blender that is called a VOLIXER. You can get more information on this much more powerful device by sending an e-mail request to [email protected] This VOLIXER has been put in service to manufacture a new mineral supplement called Green Ionic Minerals (GIM, for short, pronounced JIM). The ingredient list of this new mineral supplement is given in the picture of the label below. This new supplement is available by sending an e-mail to [email protected] and he will explain how to obtain it. What is remarkable is that this supplement has a much sweeter taste, after volixing, than it would have otherwise. The starting taste is the bitter metallic taste of the minerals. Currently experiments are being conducted to observe the effects of adding the GIM in the starting water in the magnetic blender. One expectation is that the magnetic blending will accelerate the effects of the GIM, in that the homeopathic imprint of the GIM can be dispersed throughout the water being magnetically blended. More generally, one also might try adding herbal mixes to the water and Celtic salt before doing the magnetic blending. One expectation is that the herbal mixture will be much stronger afterwards because of ORMUS related homeopathic imprinting of the magnetized water. Lastly, here is a recipe for making a powerful ORMUS barley grass. Start with your favorite recipe for making barley grass in your favorite sprouter, etc. . . Then, when it comes to watering the sprouts and the seeds, modify the watering solution as follows: put 48 oz. of clean tap water in the magnetic blender jar or the VOLIXER jar. Add 6 drops of Sea-Crop concentrate (see www.sea-crop.com) and run for 3 minutes. Use this water to rinse and water the barley grass and harvest as usual. Again, we liked this recipe so much that we are offering a good-tasting commercial version of this barley grass called Wild-Crafted Grass Juice with Lemon-Ginger Flavor. You may send an inquiry to [email protected] to get more information on this raw juice concoction. Did I say it tastes good too? use two sided tape to fix the alternating “C” set assemblies to the blender. Tighten the Velcrow (or in Japan -“Magic Tape”) untill the rods “kiss” the glass. Magnetism is a phenomenon involving magnetic fields and the effects on other materials exposed to a magneticfield. A magnetic field is a region of forces that exists around a magnet. The field can be drawn as a series ofcurved lines, called “lines of force”, joining the north and south poles of the magnet. The Earth itself behaves like agiant magnet. Its magnetic field, caused by electric currents inside the liquid part of its core, stretches thousands ofmiles into space. Fields from both permanent magnets and electromagnets have the same effect on surrounding objects and are both referred to as “electromagnetic” fields. The force generated by an electromagnetic field together with gravity,the weak atomic force, and the strong atomic force, constitute the four fundamental forces of nature. # How do magnetic fields affect the body? Magnetism affects the human body through the circulatory system, the nervous system, and the endocrine system.It is constantly penetrating all particles, right down to the atom. Magnetism’s ordering effect on living systemsarises from the fact that magnetism is a blueprint of life itself. Recent research indicates that magnetism has a verysignificant biological effect on the human body. Following is a list of the processes believed to take place when thebody is exposed to magnetic fields, which contribute to pain relief and improved health. 1) Magnetism increases the electrical conductivity of the blood. Weak current runs through the magnetic field andthe quantity of ions is increased – the ionized blood circulating throughout the body improves the efficiency of bloodflow, as well as stabilizing blood pressure. 2) Blood contains iron, or ferrous hemoglobin, which is a carrier of oxygen and carbon dioxide. As blood circulates through the lungs, fully magnetized ferrous hemoglobin is able to carry more oxygen to cell tissue as well as take more carbon dioxide waste from cells back to the lungs for removal. 3) When tissue is exposed to a magnetic field, a secondary current is created around the flux lines in the cells. This ionizes the protoplasm and energies the cell tissue by activating cell metabolism. Cell functions are strengthened as the cell metabolism responds to the electrical currents initiated by the magnetic field. This current can cause muscle spasms to decrease, as wel as decreasing inflammation of tissue. The increase in the cell metabolism aids both new cell growth and cell regeneration. 4) The negative pole energy of a magnetic field interferes with the ability of nerve cells to transmit pain impulses to the brain where the pain is registered. When a negative magnetic field is placed over a nerve, the positively charged ions of the nerve impulse are attracted to the negative magnetic field, thereby impeding the flow of the positively charged ions through the nerves to the brain. 5) Magnetism may work to regulate and/or normalize hormone secretion in the glands. A theory is that the increased electrical current being produced by a magnet forms a ‘net’ around the glands and secretory ducts. Increased concentration of oxygen stimulates production while the ‘net’ optimizes secretion. Normalizing the hormone functions within the body affects conditions caused by a hormone imbalance. Hormones are an important factor in rejuvenation and overall energy levels, while proper circulation ensures that hormone levels are distributed evenly through out the body. # Recent Research: Physicist Dr. Buryl Payne has published in-depth studies on magnetic fields and the body, and is considered to be an authority on the subject. According to Dr. Payne, sensitive instruments have allowed scientists to observe and record some of the ways magnetic fields affect living organisms – specific factors now known to be involved in magnetic healing. An increase in blood flow along with the resulting increase inoxygen carrying capacity, both of which are primary factors in helping the body heal itself, can be attributed to the presence of a magnetic field. Magnetic fields can also change the migration of calcium ions, which can bring calcium ions to heal a broken bone in half the usual time. The PH balance of body fluids, which are often out of balance in connection with illness, can apparently be altered by magnetic fields. The level of hormone production from the endocrine glands can bechanged and enzyme activity can be altered by magnetic stimulation as well. Dr. Paynes findings are supported by a number of studies by other doctors. Dr. Kenneth MacLean, founder of the Institute of Magnetics in New York, has treated cancer patients described as “hopeless” with powerful magnets. After studying microscopic cellular changes after the magnetic treatment, his conclusion was that “exposure to strong magnetic fields was at least beneficial in every case and harmful in none”. His patients reacted so favorably, in a few cases becoming virtually pain free, that he has expanded his electromagnetic treatment. Researchers in California, at Loma Linda University’s School of Medicine, have found, following studies in over a dozen countries with over 1,000 patients, that “low-frequency, low-intensity magnetic energy has been successful in treating chronic pain related to tissue ischemia, and also worked in clearing up slow healing ulcers, and in ninety-percent of patients tested, raised blood flow significantly”. Magnetic therapy is receiving coverage in medical journals as a treatment for osteoarthritis. Trial studies have been performed on groups of people where half were treated with electromagnetic fields, and the other half received a placebo treatment. At the end of the study, the electromagnetic treatment group indicated improvements over the placebo group in symptoms including pain, tenderness, and the ability to perform daily activities. Peter Gwynne reports in a recent issue of MIT’s Technology Review that “Biomagnetisim is promising to take a role in medical diagnosis, helping physicians zero in on a spectrum of ailments ranging from brain disorders to lung disease to liver conditions”. The U.S. Federal Government has invested several million dollars in magnetic research. Although scientists state that biomagnetisim is still an experimental science, and not established as a diagnostic procedure, they do agree that, unlike many other alternative medicine techniques, biomagnetisim is non-invasive and not harmful. Veterinarians have been using magnetic therapy as a treatment for injury and pain, especially in horses. Vets and trainers are placing magnetic therapy products around injured parts of horses. They claim that the healing process is enhanced by using them. Reputable vets and trainers have noted positive effects using magnetic therapy as part of the treatment process. # Negative vs. Positive Pole (North vs. South): A current point of contention involving magnetics is when to use the negative (or north) pole and when to use the positive (or south) pole. This idea started in the 1930s with studies done by Davis and Rawls which suggested that exposure to negative poles enhanced health, while positive poles did not. Recently, Dr. William Philpott has been supporting this view based on his own clinical experience. Other researchers claim that alternating polarity arrangements are more beneficial (having both poles on the same surface of the magnet). Additionally, some claim that polarity has no impact on the benefits of magnetic fields. There are no conclusive clinical studies showing that a particular polarity is more or less beneficial, but this is an issue that will probably be more thoroughly studied in the near future. If you find that you would prefer to use a specific polarity, keep the following in mind: There are two conventions of naming the north pole of the magnet: 1) the traditional, scientific, or navigation way; and 2) the magnetic therapy way. Using the traditional method, the part of the magnet that points towards north (such as in a compass) is labeled the north pole of the magnet. The magnetic therapy method is the opposite – the pole that opposes the north is labeled the north pole of the magnet. Strictly speaking, the traditional way is incorrect, as like poles of separate magnets resist each other – opposite poles attract. So, the pole of magnet that points north is, in fact, the south pole of the magnet. Makes Drinking Water FUN! Our delightfully powerful Water Vortex Magnetizer and experimental ORMUS Concentrator is one of our most powerful and fun research tools. We use it for energizing water, and for our experiments with concentrating ORMUS in various water samples. One of our favorite uses is to put 1/4 teaspoon of Celtic Sea Salt and 1/4 teaspoon of Vitamin C Crystals in a small bottle (24 oz.) and implode them into a high energy drink. Theory: The Water Vortex Magnetizer utilizes Magnetohydrodynamics. By treating the water magnetically, this effects the ionization process. By reversing the polarity of the ions at the molecular level, it reduces surface tension and inhibits growth of bacteria. The Water Vortex Magnetizer transfers its own natural vibrational imprint onto any water, including tap water. This means that any imprints from chemicals or toxins in the water are erased, and the new natural pattern of vortex magnetic implosion energies are applied. The users intention may also play a very powerful role in the re-patterning process. Vortex energy is at work everywhere and is the workhorse of the universe. The vortex is the bridge between the unseen and the seen and is the form of motion which steps up speed in space, gathers energy or potential together and combines that energy into matter or mass and crystallizes the design of its matrix which resides in the invisible background universe. Vortices guide lifes processes by centripetally charging, feeding growth, and then centrifugally discharging it and bringing it back to non-motion or static existence. This centripetal and centrifugal motion has the ability to re-structure water by directly drawing energy from the universal matrix because the vortex movement is the only movement nature uses to produce its many wonderful effects. Magnets: Six ultra-powerful cylindrical neodymium magnets are aligned in a rapid field reversing array and are combined with the special mineral powder Aulterra. “Aulterra” is a homeopathically activated combination of natural paramagnetic and diamagnetic substances which produce a significant enhancement to the implosion process. The magnets are precisely placed in a hexagonal configuration based on sacred geometrys master secret, the Vesica Piscis. We believe that the six powerful magnets combine with the vortex implosion energy to restructure the water into a pristine and harmonious state. The shape of the Water Vortex Magnetizer spiral follows the harmonic spiral space curve. Researchers are now discovering that imploding water at a high rate of speed through a rapidly reversing magnetic array may concentrate ORMUS, or M-State materials which are thought to be very beneficial and related to White Powder Gold. You can read more about on the Yahoo ORMUS Group located HERE http://groups.yahoo.com/group/ORMUS/ . David Hudson used the acronym ORME to refer to Orbitally Re-arranged Monoatomic Elements which he patented in 1989. – Fill one bottle 2/3 full of water and set on table. Screw on the Water Vortex Magnetizer. 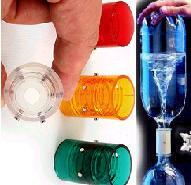 Turn the second bottle upside down and screw into the top half of the Water Vortex Magnetizer. – Invert both bottles and hold the bottom bottle with your left hand and spin the top bottle with your right hand clockwise a few times. This will create a nice vortex in the top bottle. – Repeat step B two more times. – You can also experiment by alternately rotating the bottle clockwise and then counter-clockwise which we believe may erase any negative imprints in the water structure. – We are often asked, which water bottles work best? Almost any standard water bottle works just fine, however, we have found that the brand “SmartWater” by Glaceau () is ideal in shape and thread pattern to produce a perfect water vortex. SmartWater bottles come in several sizes and we prefer the 750 mL. SmartWater is available at many natural food stores including Whole Foods. Price: $27 ; Plus $9 Shipping & Handling ; The Water Vortex Magnetizer comes in the four translucent colors shown, however all four colors may not be in stock all the time. You may request your first and second color choices in the comment field of the order form and we will do our best to accommodate your preference. Big thanks to ‘Kris’ from the whitegold list for telling us about laser charging. This device is what I came up after hearing about it, and it is in function similar to what Kris uses. It is really cheap and easy to build. Here is a (crappy) picture of the final unit. It is made from a 0.5 liter glass jar. They are sold for making jam. The jar is covered in aluminum foil tape. Another way would be to use aluminum foil and tape it on. The entire jar is covered, making it ‘light tight’. The inside of the lid is covered as well. A hole is drilled in the lid, and a cheap $2 1mW bullet style laser pointer is fixed in the hole with tape. I also filled the bottom with quartz crystals because they help to scatter (and possibly structure) the light. But it does work without them. Now the jar is simply filled 1/3 to 1/2 full of liquid. If a dark juice is used I usually dilute it with water to make it more permeable to light. The lid is screwed on, and the laser is turned on for 30 seconds to 1 minute. So far I have not exceed that time. Results (Feb 12 2004): I did try grape juice once, but my personal favorite is prune juice. Laser charged prune juice (sold as “prune nectar” containing only prunes and water) makes me sleep really well and I feel much more awake in the morning. It has also made for more vivid dreams. It makes me a bit tired (and heavy feeling) so I take it only at night before bed. I also can become very still before falling asleep, feels like first steps to oobe. Prune juice is suppose to be good for that. The grape juice I only have tryed once, gave the strong feeling in the head, as usual. I think all the added sugar in my grape juice is reducing it usefullness. Preparing it as per the $2 Monoatomic Drink http://www.ormus.ws/ormus/CW/$2MonoatomicDrink.html may yield more interesting results. This device is a lot easier to build and use than the CMV http://www.geocities.com/undergsci/mstate/cmv.html , and it also does not seem to have build up effects. With the CMV, after a week of experimenting I felt that I was “charging up”. I couldn’t ingest much charged juice, as the feeling in my head was getting close to being a headache. It was a lot like a Primary Energy http://primaryenergysystems.com overdose, vortexes apparently create PE, and water can store it. I encourage others to build these, they seem like an excellent way to charge ormes. More is coming…. I can be reached on the ormus_swg – Science Workgroup http://groups.yahoo.com/group/ormus_swg . Please post questions on the list, and not to my personal address. This way everyone benefits from the discussion.